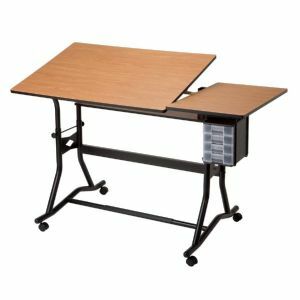 A larger and more robust version of the popular CraftMaster series of tables, the CraftMaster III Split-top was designed for those who prefer two independent work surfaces: one that tilts for drawing and one that’s fixed for holding a laptop, books, tools, or beverage. Serious students, artists, and professionals will find this table unmatched in function, performance, and value. It is truly drafting-height and features an enlarged leg frame design, readily accepts standard parallel straightedges, and maintains an attractive color scheme that fits well in most homes, offices, and studios. Tilt-adjustable 30" x 42" section on the left and fixed 30" x 18" section on the right. Total work area is 30" x 60"
*THIS PRODUCT IS A TRUCK SHIPMENT ONLY. UPS RATES DO NOT APPLY. PLEASE INQUIRE BEFORE ORDERING!